Is your enterprise ready for AI? 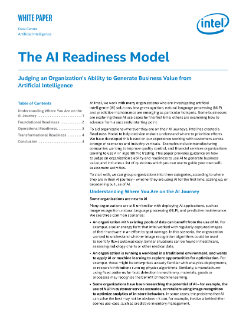 Whatever stage of deployment your organization is at, the Intel AI Readiness Model is designed to identify where and how use cases including natural language processing, predictive maintenance and image recognition can be deployed in your organization. At Intel, we work with many organizations looking to deploy artificial intelligence (AI) solutions. ...Image recognition, natural language processing (NLP) and predictive maintenance are emerging as particular hotspots. Some businesses are exploring these AI use cases for the first time; others are examining how to advance from a successful starting point. To aid organizations wherever they are on their AI journeys, Intel has created a readiness index to help decision makers understand where to prioritize efforts. We have developed this based on our experience working with customers across a range of scenarios and industry verticals. For example, manufacturing companies wanting to improve quality control, and financial services organizations looking to use AI in algorithmic trading.